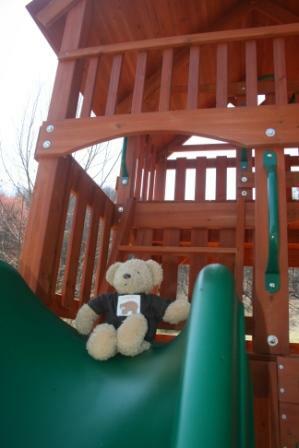 Pierce's preschool has a bear named Buddy that goes home with a different family each weekend. This past weekend was our turn. Buddy comes with his own tote and some outfits. He also has a few instructions - that he needs a book before bed and sleeps with your child. So the first night he insisted on reading a bear book. 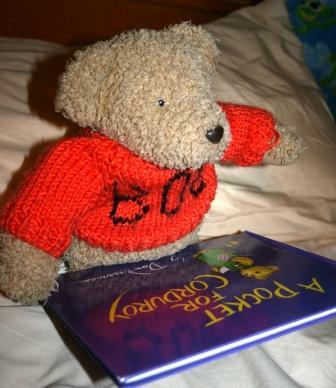 In fact, every night he wanted to read bear books. Good thing we like bears so much at Two Bears Farm. Over the course of the weekend we put Buddy to work on the farm. First, he had to help feed the chickens. At first, he was a little intimidated by Elvis. But after a while he realized she is a friend. 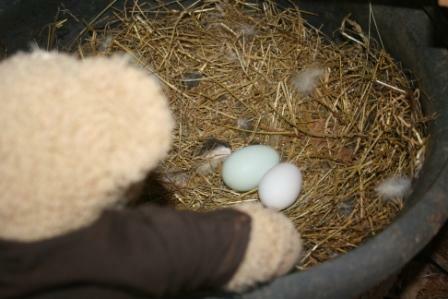 Buddy helped gather eggs and he found two, one of them was a blue egg! Blue eggs are from our Americauna hen, Natasha. All that work earned some play time. Buddy had fun going down the slide. 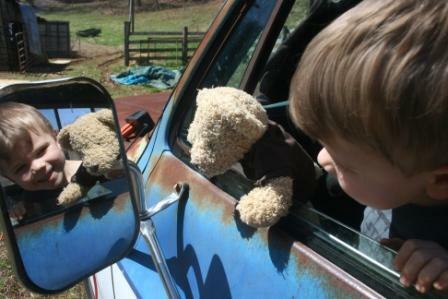 Then while we worked on the garden, Buddy played with Pierce in our old farm truck. We we came inside for the day, Reid confiscated Buddy. 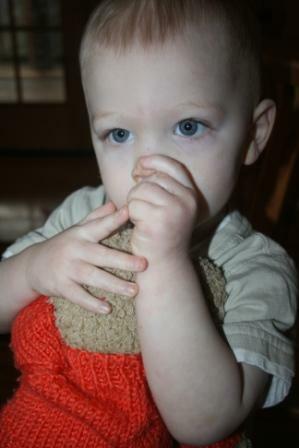 Reid has always had a weak spot for soft furry toys. Ah, a busy day! Time to relax on the porch swing. Thanks for coming to visit Buddy! You're welcome back anytime! Don't forget to enter my giveaway for two young adult horse mysteries - click HERE! I bet Buddy has a hard time going back to school. It looks like he had a wonderful visit. Sounds like Buddy had a great time! I love the pictures. so cute! We had our daughter's preschool bear over Spring Break! She was so excited! It looks like Buddy had a wonderful stay at your house! I loved the creative photos! O that is so cute, and I too reckon that buddy will be trying to sneak off to your house often for his weekend trips. And how cute is that gorgeous wee guy all snuggled in with buddy. Adorable. I think Buddy would have liked to stay at your house. So much to do and see but relaxation time too! How fun! Love the pictures, they are too cute!! I looove it when teachers do this activity. So awesome for the kids.....magical! You did a great job capturing the moments! That is cute! Livie loved this post and says she loves the blue eggs. That was absolutely too cute!!!! The egg gathering really made me chuckle! Living the life of a bear looks like great fun at your place!!! Wow to those chickens, this is the first time I've seen them, being a new follower. Why Elvis? That is cracking me up! I got some local organic eggs at Whole Foods last week, and two are green!!! I was excited! 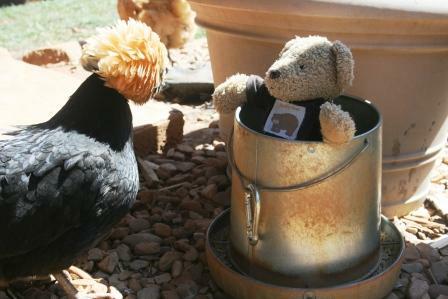 But little Ella rufuses to believe eggs can be green, she insist's they are dark white! 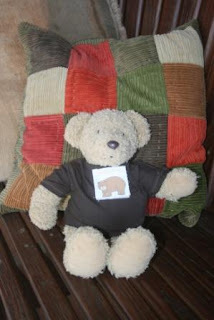 What a good idea for the pre-school to have a travelling bear!! They must be a very good one! What a grand visit for Buddy! I hope you sent those pictures back to your son's school! Oh, how cute! I love the pic of the two of them in the truck. That is so sweet! Love the picture of him looking in the mirror in the farm truck! Also the one of Reid! Too cute! Looks like Buddy had a great time at your house! Oh how cute! I hope my son has fun things like that in school ... great pictures! Loved when our kindy-bear came to visit. Looks like Buddy was well taken care of while he was at your house! I bet your boys had a blast with him. What a cute idea. How adorable was that post! LOOOVE that picture of Buddy & Pierce in the side mirror of the truck... so cute!